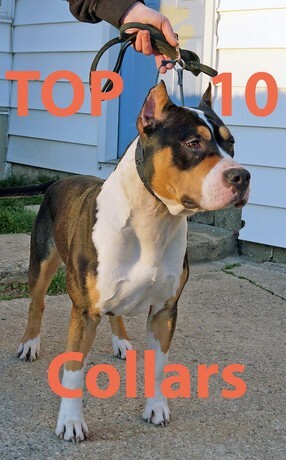 TOP 10 Collars, the Best Training Collars and How to Use Them. Last week we gave 5 Reasons why Training Collars Work. This week we want to explain the top ten dog collars, the best training collars, and how to use them. 1. Buckle Collars are simply collars that fasten with a buckle. Made of nylon or leather, they can be flat or rolled. Adjustable ones are best for growing pups. These are the best collars once a pup or dog is trained and these are the collars dogs/pups should be on when put on a chain or not supervised. 2. Break-away Collars are a special quick-release collar that will unfasten if a strong pull is placed on the collar. However, the collar will not unfasten if fastened to a leash. This was invented due to the owner’s dog dying after getting his collar caught on something. These, again are not training collars, but can be worn all the time for comfort/safety. 3. Limited Slip Collars are adjustable collars designed to tighten around a dog’s neck, but will stop before they constrict or choke. They’re good for dogs who slip their collars, but this will again give them no correction for training. 4. Body Harnesses are NOT collars. But many people use them, thinking they will be able to keep a dog from pulling. When you think of dogs who typically wear harness, you think of dogs that pull, such as sled dogs. However for small breeds and toy breeds there are some nice harnesses that are better for training than collars such as the NO PULL HARNESS. 5. Head Collars (Gentle Leader, Halti, Promise Collars) are commonly advertised to use for dogs that pull. Owners are led to believe they are “Gentle, and Humane”. (Yet this same manufacturer produces the most popular brands of Shock Collars). They are one of the most uncomfortable correction tools that a dog could possibly wear, and they can even cause a dog to snap and break their neck. 6. Martingales are similar to limited slip collars, but don’t have a buckle. They are often used for sight hounds, because their head and neck are smaller and they can slip most other collars. These collars apply even pressure on the neck, to give a slight correction. 7. Electric Collars, also called remote or e-collars by advertisers or shock collars by those against them, are devices that deliver an electrical stimulus to cause pain to the dog when given a correction. I do not believe in the shock collars for training, but I do think that if they have a vibration rather than a shock that these can be excellent trainers when working with deaf dogs! 8. Choke Chain (Slip Collar) is a chain or nylon rope with rings at either end that loops around the top of the dog’s neck, just behind the ears. The ring which connects to the leash goes over the back of the dog’s neck, not under. This is one of the collars I most recommend in training both puppies and dogs. It will give a correction when put on correctly. With dog walking on your left, always be sure to put collar on with slip knot around pups neck forming a letter “P” for puppy—then you’ll know it’s on correctly, long end hanging on dog’s right side, your left when facing your pup. Never leave pup or dog unattended with this or any other training collar on. 9. Prong Collars (may be mistaken for Pinch Collars) are also used for the same purpose as the choke collar to give correction as needed. With these it’s a side correction, a quick snap, and release. The prong is actually far safer and one I use more in training. This collar prevents dogs from pulling due to the evenly distributed pressure it gives against the dog’s neck. I see the best results with this collar when it is used correctly. 10. Plastic Prong Collars is just a modified prong collar, but made from plastic. They may be more appealing to owners. It works well for dogs that constantly pull on the leash, but not so much that a traditional prong is needed. Did you know that we are similar to dogs? God actually compares us to sheep. Sheep are way dumber than dogs, they just follow one another blindly without a shepherd and will even wander off a cliff to their death. Dogs are way smarter than that, but they still need a good trainer to be safe and sound. Just as we need a Good Shepherd to stay safe and achieve suxxess in life! Happy Training for you and your dog! Feel free to ask questions you have about your dog or puppy and we may post it on our website or in an upcoming blog. All the above 10 techniques are really very helpful. As you have discussed about Nylon ropes, would like to recommend to buy nylon ropes from Axiom Cordages. It is a rope manufacturing company and manufactures different different types of Ropes.